23.05.2012 is a red letter day for Sevalaya as one of her daughters D.Selvi entered into wedlock with Mr.A.Vijaya Senthil (Associate Consultant, Polaris Solutions) on this day. The wedding was solemnized in the presence of Honorable Minister for Environment, Mr. B. V. Ramanaa B.Sc., D. Pharm., Honorable Member of the Legislative Assembly Mr. N.S.A.R. Manimaran, Mr.Putlur. R. Chandrasekar – Chairman, Thiruvallur District, Social Welfare Officer Ms. Ruth Vennila, Probationary Officer Ms. Syad Ravoof, District Councillors Ms.A. Selvakumari, Ms. Bommi and Film Artiste Ms. Revathy . 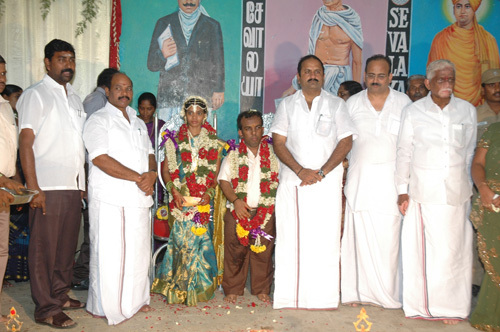 The Minister blessed the young couple and congratulated Sevalaya for conducting an unparalleled event. The Minister also appreciated Sevalaya for not only providing the basic needs of food, shelter and education to the destitute and underprivileged children but also ensuring that they are well settled in life and mentioned that Selvi’s wedding is a standing example for this. Brought to Sevalaya at the tender age of 5 by Thiruninravur Police, Selvi grew up in Sevalaya’s hostel looked after by the staff and management of the trust. After completing her X and XII Std she did a diploma in Nursing assistant from Gandhigram. Soft Spoken and friendly by nature, she has many friends and well wishers in the campus and many eyes were moist as the sacred vows were said and the holy knot tied. Earlier Mr. V. Muralidharan, Founder & Managing Trustee welcomed the gathering and Mr. E.LakshmiNarayanan, Trustee proposed Vote of thanks.